Dennis Leung, MS, John Howington, MD, Mark Talamonti, MD, Jason Long, MD, Michael Ujiki, MD. NorthShore University HealthSystem, Chicago, IL. Introduction: Several complications after esophagectomy with gastric pull-up are associated with ischemia within the gastric conduit. 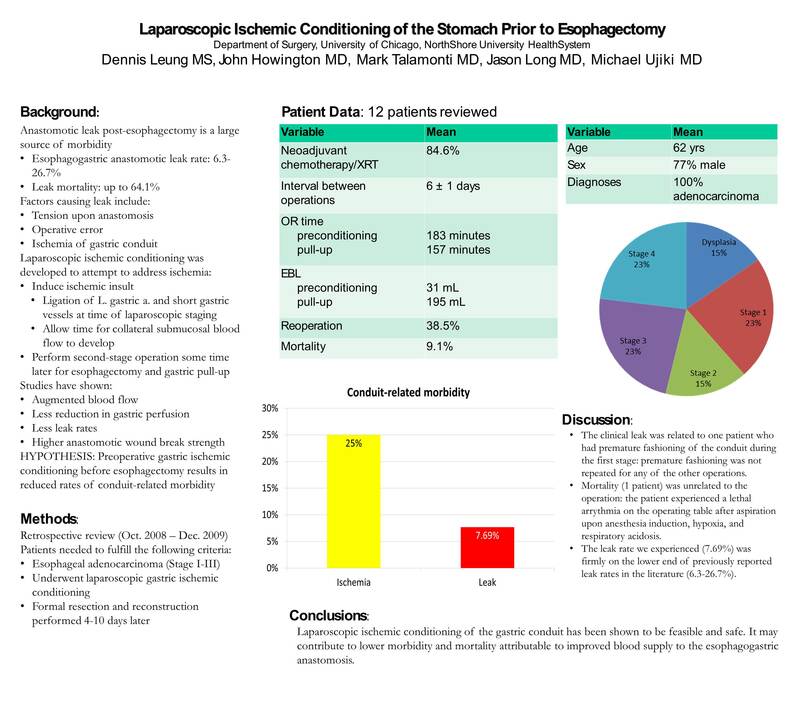 We aimed to assess the feasibility of laparoscopic ischemic preconditioning of the stomach prior to thoracotomy, esophagectomy, and gastric pull-up with an intrathoracic anastomosis. Methods: We conducted a retrospective review of 12 consecutive patients between October 2008 and December 2009 with esophageal adenocarcinoma (Stage I – III) undergoing laparoscopic gastric ischemic conditioning prior to esophagectomy. Conditioning included laparoscopic ligation of the left and short gastrics, celiac node dissection, and jejunostomy tube placement. Formal resection and reconstruction was then performed 4-10 days later. Results: Of our 12 patients, 84.6% received neoadjuvant chemo/XRT. Reoperation occurred in 2 cases prior to thoracotomy, 1 for acute paraesophageal herniation of the conduit, and 1 for tachycardia and respiratory distress that resulted in a negative exploration. Two patients remained in the hospital between procedures while 10 were discharged on either post-operative day 1 or 2. Three patients had ischemia of the conduit where the anastomosis would have been placed if a single-stage procedure had been performed. One anastomotic leak occurred in the only patient that underwent partial conduit fashioning during the initial stage. There were no cases of delayed gastric emptying. Conclusions: Laparoscopic ischemic conditioning of the gastric conduit has been shown to be feasible and safe. It may contribute to lower morbidity and mortality attributable to improved blood supply to the esophagogastric anastomosis.